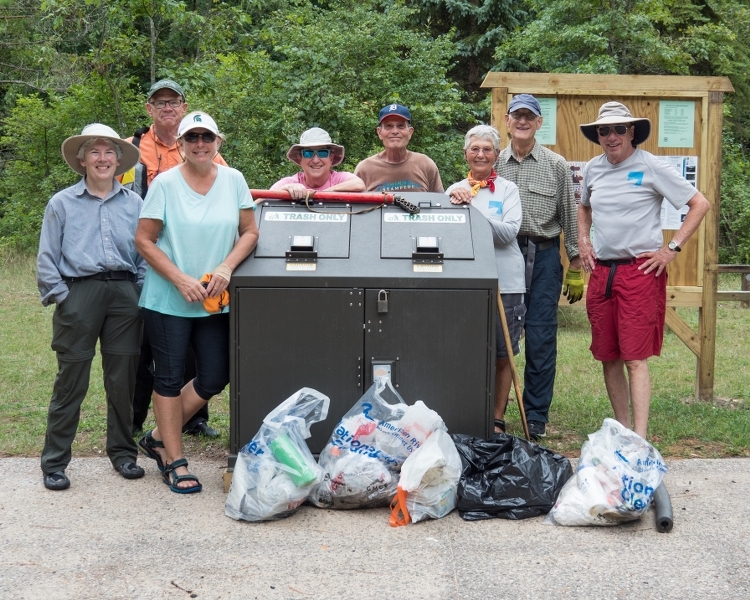 Amazingly, in between two days of strong thunderstorms that swept across the State, the weather calmed and the sun came out just long enough to allow us to maintain our scheduled Pine River Clean-Up from Dobson Bridge to Peterson Bridge on August 28th. It was the sixth and final clean-up of the Pine by TAPC this season. The crew was comprised of Lois Goldstein and John Heiam, Tom Auer and James Woodburne, Jane Cloutier, Marlene Puska, and Donna Steinebach and Tom Lipps. The clean-up started a little slow, with minimal trash being found. The heavy rainfall the day before had made the water very murky. Despite having been promised crystal clear water, the river was much too cloudy to see any trash on the bottom. While disappointing in one regard, this also meant no swimming or diving would be necessary! Despite a slow start on the trash front, things did pick up (literally!) as we continued down river, with several “mother lodes” of debris caught in log jams. All combined, five garbage bags were filled by the crew, along with a couple of rescued “treasures”. Liquor bottles, beer cans (many unopened!) and jello shots were the most frequently found items. A dozen or so flip flops were also found, which clearly proves that they are not a wise choice in footwear for a paddling trip down the Pine! Some of the more unusual trash items found during the clean-up were a Tyvek jumpsuit, a combination radio/flashlight (full of heavy batteries! ), and a fully operational water cannon! A waterlogged and split wooden canoe paddle was also found and is now in clamps drying out to see if refurbishment is possible. Having read several previous trip reports on Pine paddles, we were expecting some “special” excitement. Sure enough, shortly after our lunch stop, Lois and John were the first to arrive on the scene of a young couple in chest-deep water clinging to a large log on the opposite side of the river from their young children and a small dog. The family had been fishing when one of the fishing lines became stuck on the log. After both of the adults had made it out to the log to try to free the fishing line, they realized the strong current would be too much for them to make it back across. Their three children, much too young and far too small to be of any rescue assistance, waited on shore, watching their parents' dilemma. Tragically, the couple had life preservers, but misjudging the depth of the water and the strong current, had left them laying on the shore with their children! After beaching their canoe, John used his rescue throw bag to reach the man. By the time most of the other Club members arrived on the scene, only the woman remained stranded. Using the incident as a teaching moment, John demonstrated to Club members the proper use of the rescue throw bag. After reaching the woman with the rope, several Club members and the woman’s husband helped to pull her to shore. The couple was extremely grateful for their rescue, and hopefully the whole family, especially the young children, learned a valuable lesson about safety near and in the water! 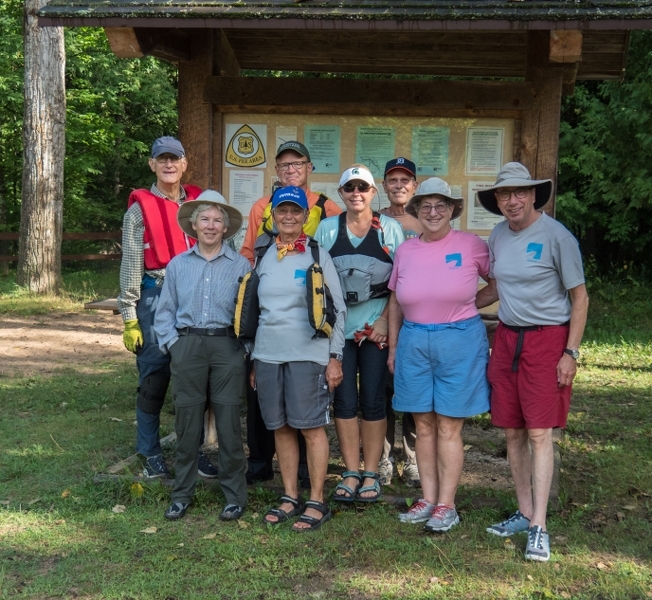 Special thanks to Pine River Paddlesports Center for providing several kayaks and a canoe for the clean-up, and to Marv Puska for assisting with the shuttle and group photography.